The name, CHARTRES, belongs to the category of names derived from the place where the original bearer dwelt, or where he once held land (Chartres, France in our case). Chartres was in Gaul one of the principal towns of the Carnutes, a Celtic tribe, in the Gallo-Roman period, it was called Autricum, a name derived from the river Autura (Eure), and later called civitas Carnutum, ("city of the Carnutes"), from which Chartres got its name. The name is derived from the title of a Gallic tribe, The Carnutes, which signifies ‘the trumpet people”, and was introduced to Britain following the Norman invasion of 1066. Chartress, Charters, Chateris, Chartis and Chatteris. Chartres is the capital of the Eure-et-Loir Department in France. 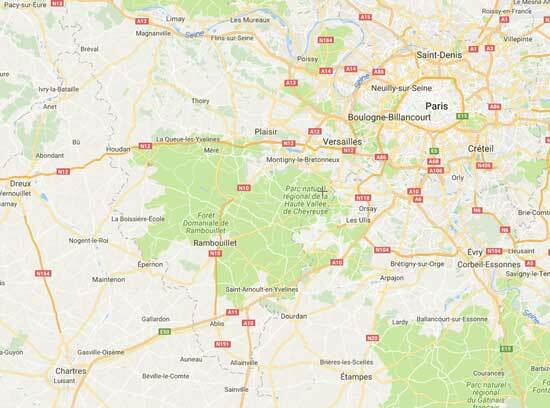 It is located 95km (60mi) south-west of Paris. (The city is best known for its Cathedral which is considered one of the finest and best preserved Gothic cathedrals in France and Europe. 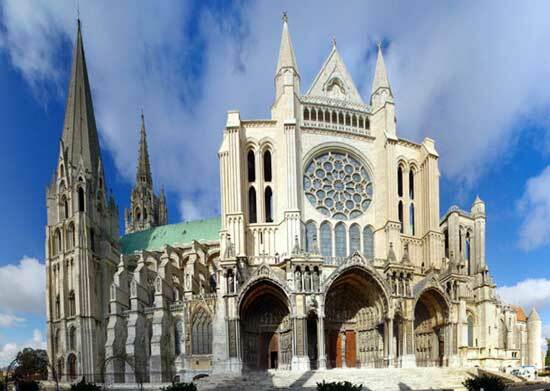 Begun in 1205, the construction of the Notre-DDame de Chartres was completed 66 years later. The Chartres Cathedral, French Department of Eure-etLoire, France. MOTTO Non Gladio Sed Gracia. The actual description of the shield. ARGENT: The base colour of the shield in colours, White or Silver. AZURE (Blue) the colour of the stripe. Two shield shapes within the main shield. Signifies Military Strength and Magnanimity. That which appears above the main shield. Signifies Filial Duty and a Close Parental Bond. I have chosen to include this information, not to suggest that our family has a right to the Crest, but out of my own interest in the subject. 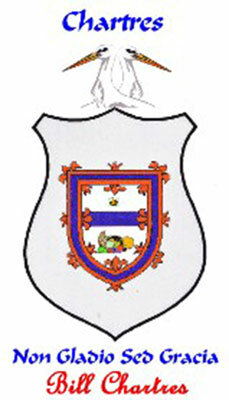 Since I designed this crest myself, I would assume that it bears little, if any, resemblance to the original, and I have chosen not to include any mantling (artistic scrolling around the crest) , but have added a Horn of Plenty, to signify our family's involvement in the Fruit Industry in Australia. I designed the Coat of Arms using a description, on a Family Name History plaque given to me as a Christmas present in 1992 by my son Wayne. Many Heraldry outlets will sell any one their Family Crest, but they do not establish the purchaser’s right to the Arms. Note: It must be realised that there is no such thing as a Family Crest / Coat of Arms, for a particular name. Arms were granted to individuals, not to families, and are handed down by natural progression of the direct family line. Since the majority of Arms were granted many hundreds of years ago, it is extremely difficult to establish this direct line of descent, and I do not claim this to be "Our" Family Crest. The Family Motto was not granted as a part of the arms, it was a matter of personal choice for the recipient, and, in fact, was often changed as the Arms progressed dawn through generations. Unfortunately I know very little of my (Chartres) family history, and it was too late to find out when I decided to begin my research as my parents and most of their generation had passed away. I have checked as many records as I can but with little success. I never knew either of my father's parents, as they both died soon after I was born. However, from an early age I had been curious about the Chartres Family and its origins, but it just did not feel right for me to ask questions, the older family members never spoke of their ancestors, so I just assumed that it was something that should not be talked about. The one exception to this was Uncle Jim (James Chartres 1922 - 1994) at a very young age I can remember him making occasional comments about his father being known as "The Little Frenchman", and referring to another family member (whom I did not know), as "The Black Sheep of The Family", but never by name [I later found him to be my Great-grand father (Thomas Walter Chartres 1851 -1922). He left his wife and went to the Flinders Ranges area, and later bigamously remarried and had two daughters]. Uncle Jim must have been interested in the family history, as he kept a note-book in which he recorded births and marriages of our families (although he did not record the dates). In later years I remember him checking with Peg (my wife) and myself the details of our family, to ensure that he had correctly recorded them. I always felt that he would have liked to compile the family history. Once I had decided to try to find out a little more of our history I knew that this list would be the ideal place to start. At that stage I only knew that my Paternal Grand-mother's name was Mary and my Maternal Grand-fathers name was Percy Alfred Tyrrell (1883-1957)(he was the only one of my grandparents that I ever knew). "Percy", as all called him, also had a former nickname. It appears that as a young man while living at Ovingham, near the North Adelaide Parklands, and was often seen strolling through the park all decked out in his "Sunday Best", including white spats (white covers over his shoes) and carrying a cane, and he became known as "The Man Who Broke the Bank at Monte Carlo". When I obtained a copy of Uncle Jim's notes I was ecstatic to find, not only the details of his generation, and much of mine, but also the names of his parents and grand-parents (including the maiden names of their wives). To me this was an unexpected bonus, I now had a real basis for my research. A couple of years later I had another stroke of good luck, I was able to contact Doug Smith (1928-? ), my second cousin once removed, who was researching his family. Doug's Grand-mother (Mary Ruth Chartres 1846 - 1924) was my Great Grand-father's (Thomas Walter Chartres 1851 - 1922) sister. Doug had spent considerable time in London researching his family, and his research, into the Chartres line, ended where Uncle Jim's notes began. Now I had comprehensive details of my direct line from 1700 to about the mid 1970's. All I had to do was fill in some missing details and dates, then complete the last few years. 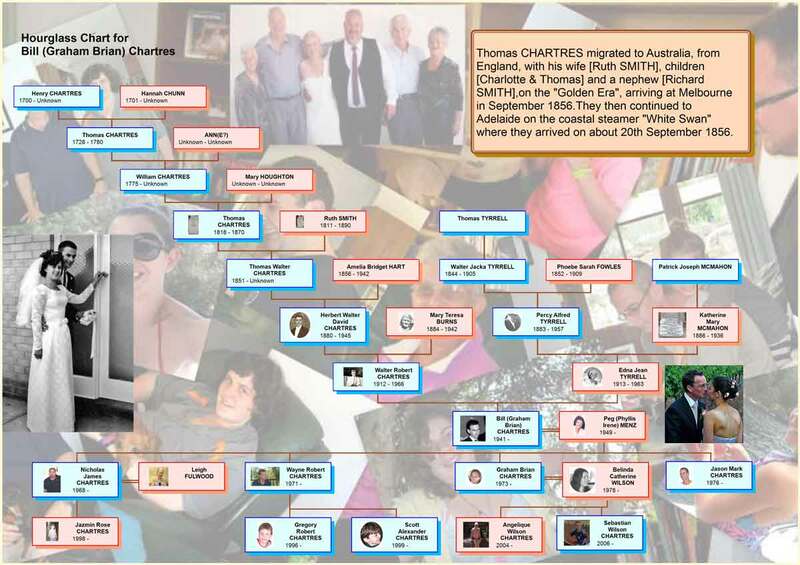 This did not prove to be very difficult, however I realise that I should have done this research many years earlier when I would have been able to interview so many more people and obtain the stories and antidotes that go to make up a complete Family History, however I do now have a branch of THE CHARTRES FAMILY TREE. The information on this page is taken from a booklet that I compiled on my family. During the booklet's preparation I visited many of the Chartres graves that I have been able to locate. They are located in West Terrace Cemetery, North Road Cemetery, Dudley Park Cemetery, Enfield Memorial Gardens, Oodlawirra Cemetery and Hawker Cemetery. 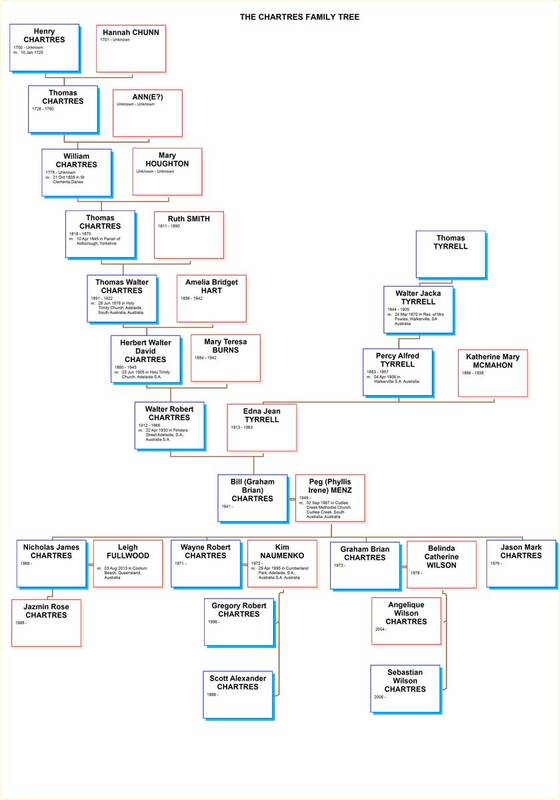 I compiled it as a record of our family line, for the benefit of our children and future generations, so as they may have a better understanding of our family origins. (I have chosen to only include my direct line on this web-page, however if anyone would like more information, a Ahnentafel style report can be seen. Thomas Chartres, (1818-1870) was born in London, England in 1818, and he was Christened 10th November 1818. He married Ruth SMITH (1811-1890) on 10th April 1845 in the Parish of Aldborough, Yorkshire, England. Thomas and Ruth had 5 Children, Charlotte (1849-1863), Mary Ruth (1846-1924), Lydia (1847-1847), William (1847-1847) (Twins died soon after birth), and Thomas Walter (1851-1922). Thomas (age 37) immigrated to Australia from London in September 1856 aboard the "Golden Era". He was accompanied by his wife Ruth (nee Smith, aged 40) and their three surviving children Mary (aged 10), Charlotte (aged 7) and Thomas Walter (aged 5). After arriving at Melbourne, they then continued on the coastal steamer "White Swan" arriving at Port Adelaide, S.A., Australia 20th September 1856. In February 1861 Thomas Chartres was a teacher at Allendale School near Kapunda, SA, (in addition he was also a storekeeper) where he taught from 1861 to 1866. In 1863 Thomas and Ruth’s daughter, Charlotte, died and she was buried in the Allendale Cemetery. In 1867 he was appointed by the Board of Education as schoolmaster for the residents of Sunny Brae, (about two miles to the south west of Grand Junction, (now Wingfield). The following year he moved to Grand Junction where he was schoolmaster until his death in June 1870. Thomas Walter Chartres, (1851-1922) was born in West Hackney, London, England in 1851, and married Amelia Bridget HART (1856-1942) in Adelaide on 28th June 1878. I have very little information about Thomas Walter, however he was a Teamster and Overseer. Thomas Walter and Bridget had 2 children, Ethel Ruth (Born at Blinman S.A. Australia 24th Apr 1879) and Walter Herbert David (Born 28th Aug 1880 at Angorichina, Via Blinman, S.A. Australia). Sometime after the birth of their children the family returned to Adelaide and Thomas Walter later deserted this family and returned to the Flinders Ranges area. He later bigamously remarried (Sarah Elizabeth LAMMING (nee Mercer) 29 thOct 1901 - 2nd Marriage of T.W.Chartres. Res. Mrs. E Mercer, Oodla Wirra, South Australia, Australia) and they had two daughters (Ruth Mabel 1903-1969) and (Ada Maud 1905-2001). Sometime later he was disowned by this family and moved to the Hawker District, where he died (12th May 1922, Hawker, SA, Australia) and was buried in the Hawker Cemetery. Herbert Walter David Chartres, (1880-1945) was born 28 Aug 1880 in Angorichina, via Blinman, S.A. Australia, and married Mary Teresa BURNS (1884-1942), 3rd June 1905 in the Holy Trinity Church, Adelaide S.A.. I have no information of Herbert Walter David other than that he and Mary had 9 children. Margaret Ruth (1906-1987), Thomas Herbert (1906-1987), Mavis Lena >(1909-1967), Walter Robert (1912-1966), Francis Edward (1913-1965), John Harold (1916-1939), David Harry (1918-1967), James (1922-1994), Robert Norman (1930-1972), and he died 19th July 1945 and is buried in Dudley Park Cemetery S.A..
Walter Robert Chartres (1912-1966) was born at Hilton, Adelaide, S.A., Australia and lived in the Enfield area for most of his early life. He married Edna Jean TYRRELL (1913-1963) 22nd April 1930 at Adelaide, S.A., Australia, and soon after their marriage they moved into their home at Prospect, SA. where they raised their family. Walter and Jean had 6 children. Walter Allan (1930-1998), Kevin John (1940- ), Bill (Graham Brian) (1941-), Jillian Lorraine (1946-), Lynette Kathryn (1946-1946 died 1 day old), and Trevor Glen (1953-). Wal work his whole life in the fruit industry in South Australia. Apart from couple of years at The Prairie, Cudlee Creek, SA during the mid 1940's where he managed an orchard, he was involved in the wholesale fruit markets in Adelaide's east End. In 1948, shortly after returning to the east End Markets he set up his own Wholesale Fruit business (Chartres & Eitzen Pty Ltd), and he later added a fruit packing shed to the business which was located next to his home at Prospect. The Packing side of the business rapidly expanded so he decided to move to Cudlee Creek (1960) where he built a new home and packing shed. The fruit packing venture continued to grow and so a new larger shed and coldstore was built a couple of years later. Three of Wal's sons, Allan, Kevin and Bill, had joined him in the family business, however following his death (1966), firstly Kevin and later Allan, retired from the business to follow other interests, and Bill managed it until the packing shed was destroyed during the Ash Wednesday Bushfires (February 1983). Wal died 14th March 1966, and is buried with his wife, Jean and infant daughter Lynette in the Enfield Memorial Park, S.A.. I, Bill Chartres (1941-), was born 11th September 1941 at Northern Hospital, Prospect, S.A., Australia. Although Christened Graham Brian, I always called Bill, and actually did did not even realize that my name was Graham Brian until I began Primary School. During my early school days I was often in trouble for not responding to the name Graham! 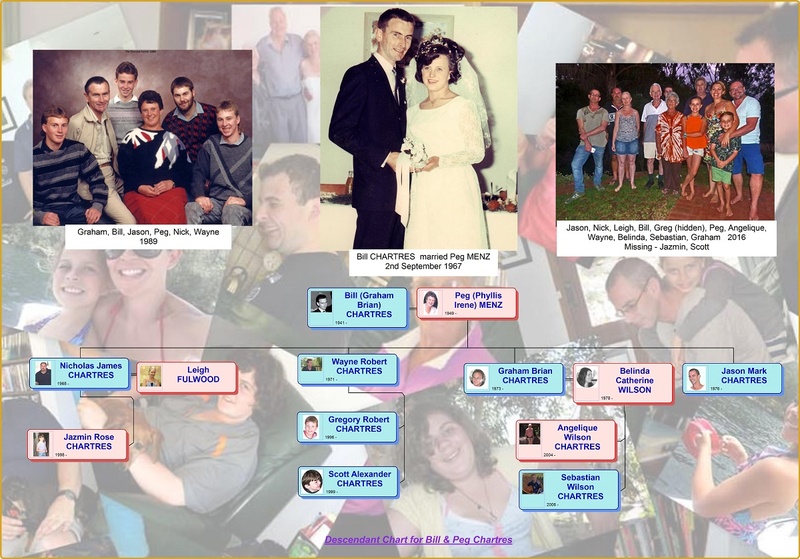 I married Peg (Phyllis Irene) MENZ (1949- ) (Peg was always known by this name, even at her schools, Millbrook Primary and Birdwood High), on 2nd September 1967 at Cudlee Creek Methodist Church, Cudlee Creek, SA, Australia. Peg and I have four sons. Nicholas James (1968- ), Wayne Robert (1971- ), Graham Brian (1973- ) and Jason Mark (1976- ). I attended the East End Markets with my father, Wal, from the age of about 5 and I always thought that I would work in markets, however, during my high school years, my teachers persuaded me that I should be come a teacher, (because, they said, that I would be wasting his life by working in the markets) but I did not feel comfortable with this, and quit Teachers College after a couple of years and to work in an office. At about this time dad suffered a heart attack and asked me to help out in the family business for six months, however once I began working in the market I realised that this was where my future was. After the move to Cudlee Creek I studied accounting and took control of the finance and marketing side of the business, while dad, Allan and Kevin managed the Fruit Packing side as well as helping in the market. Later, after dad's death, Kevin and Allan retired from the business to pursue other interests and I managed the entire business. Following the disastrous bush fires of Ash Wednesday (16th February 1983) which destroyed the Cudlee Creek Packing Shed, I, Peg and our family, were devastated so I sold the business and moved to Lobethal with Peg and our sons. Following the fire I went to work for the HL Banana group in the East End Market. A few months after I started with HL they acquired another business, which they renamed Sunshine Fruit Pty Ltd, and I was appointed manager. Following the markets relocation to Pooraka our four sons joined me at the market. I was forced to retired in 2001 due to a work injury, and still live in Lobethal with Peg. Nicholas James Chartres (1968- ) was born 11th August 1968 at Adelaide, S.A..
Like me he attended the markets from a very young age (even younger than me, he was only aged about 2) . After sometime working at the Pooraka Market with Bill, Nick transferred to HL's Transport section (Fruit Express). In the late 1960's he moved to Brisbane where he has had several jobs in the transport industry. Nick and his partner, Wendy, had a daughter Jazmin Rose (1998- ) In 2013 Nick married Leigh Fullwood, and they now live at Leichhardt, Queensland. Wayne Robert Chartres (1971- ) was born 13th February 1971 at Adelaide, S.A. Wayne married Kim Naumenko (1972- ) 29th April 1995. (now divorced) Wayne and Kim have two sons, Gregory Robert (1996- ) born 14th February 1996 Flinders Medical Centre, Bedford Park, Adelaide, S.A., and Scott Alexander (1999- ) born Woman's & Children's Hospital, North Adelaide, S.A.. Wayne started work at the Pooraka Market, but in the late 1990's he left to join his father-in-law's trophy shop business at Goodwood, where he is still working. Sebastian Wilson Chartres born 29th December 2006, Sydney NSW. Graham also worked at Pooraka Market, and progressed through the ranks to become Manager of Chiquita Brands Adelaide (Chiquita had acquired the HL group). Later he started his own Wholesale Fruit business, which he sold to shift to the Fresh Produce Group in Sydney, where he is still working. Jason Mark Chartres (1976- )was born 9th Sept. 1976 Gumeracha DSM Hospital, Gumeracha, S.A..
Jason also worked in the Pooraka Market. He now lives at Hope Valley and still works in the market for Lamanna Bananas.